August is a very special month for me personally for many reasons. One such reason is it marks the beginning of English Premier League. A football league which i have been rigorously following for last 9 years. Each player transfer, team formation all the silliest thing there excites me. As many of my friends know i support 'Liverpool' football club for obvious reasons. Last year we finished a mighty close second and were neck ahead in terms of entertainment and class compared to previous years. So as a fan it really excites me when a club improves step by step to become giant of a team in europe. I hope this year we become worthy winners and lets some loose tongues tied down. 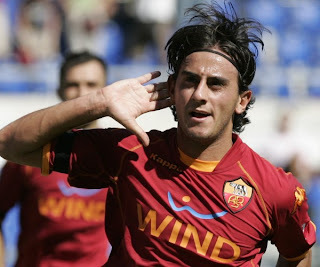 Steven Gerard and Fernando Torres still going to be our axis but i think the wild card will be acquisition of Aquilani. He will playing in front of ever present Mascherano and is good with both foots. For sure we will miss the service of Alonso but in Johnson and Insua we have good wing backs to fly the crosses in. Gerards creativity and work ethic in the middle with torres's movement upfront is gonna make some defenders wear their dancing shoes. This year will also be crucial for the dutch duo Babel-Kuyt, Kuyt must have been a TCS employee seeing the amount of work he does on the pitch and no body can question his commitment to the game. Babel once termed as the upcoming Star or the New Thierry henry has not stood up to his reputation yet. I hope this year he proves his critics wrong. Andriy Voronin is back from his successful loan period, guy wants to prove himself to the fine player he is. 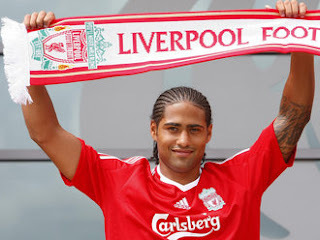 Its good to see players like him turning up and rise up to the occassion. In Pepe Reina we have one of the best goal keepers in the world and has a good ball distribution range. Carragher, Skrtel and Agger complete the best defence in premier league last year. All in all the signs are ominous and if away from injuries to prime players and the bench stands up to the occassion i have no worries over fellow premiership dreamers. 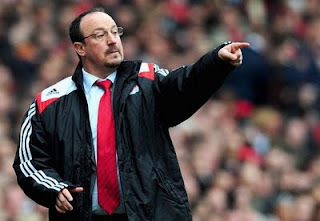 The most potent armoury in Liverpool's fire power is our manager Rafa. He might not be good at tirades (which he proved last year) like fergie. And he might not proclaim himself as the Special One. Every team in the world is afraid of the astute craftmanship this man possesses. His ethics of Football is very similar to Wenger's but a different philosphy though. Rafa can unlock any team in the world even and can vision a game much ahead of his compatriots. I personally dont care his media image because i know 'whole media is bought by Manchester United'. Rafa has a clear plan on what needs to be done and if as fans we can just rely on him he will deliver the premier league at the doors of Anfield where 'You will Never Walk Alone'. Although u can boast of a record 5 titles in a single season n other records, just remember that its been 4 years that LFC laid their hands on any cups!!! With the exit of Alonso, things look gloomier!!! Chelsea is my religion n Blue is my blood!!! We have already started with an awesome power play against ManUtd n starting the year with the first title to our name. And just keep counting. The game is on!!! and we started with a loss at tottenham..